Williamsport, PA - The Warriors are heading to Madison, NJ today in preparation for their annual battle with the Devils of FDU-Florham. After looking at the last 25 years of game play, We have a few thoughts on this game. Don't let the past set up this important game Saturday. This year's FDU team is very different from last year. The Warriors are coming off a two game winning streak as they enter the second week of MAC Play. FDU-Florham football returns home after a two-game road swing. FDU played Alvernia to a 49-14 win last weekend, moving their season record to 3-0. 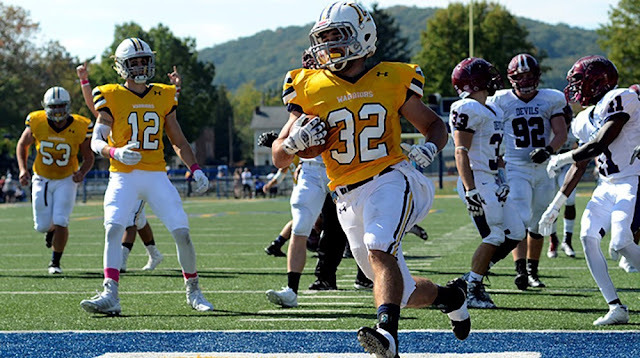 Sam Dressler walks into the end zone during Lycoming's 48-21 win over FDU-Florham. Over the past 25 years of play against the Devils, Lycoming has won 20 games and shut out FDU two times. 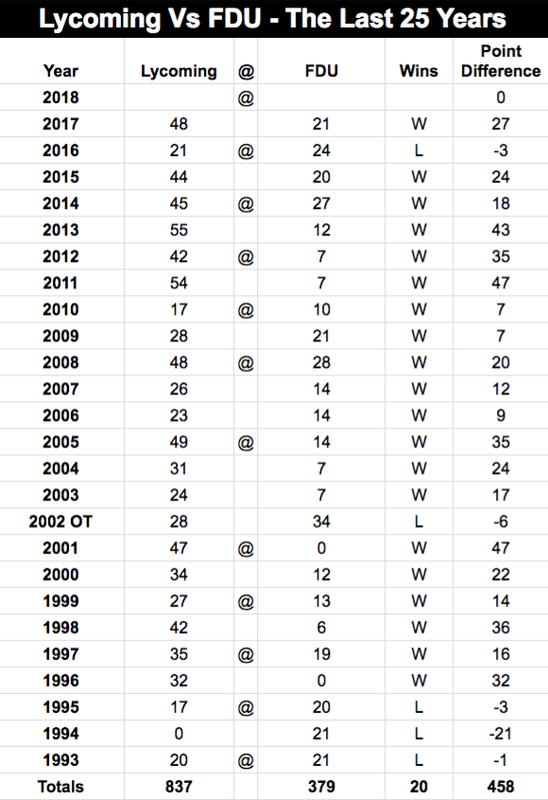 The Warriors longest winning streak against FDU is 13 between 2003 and 2015. 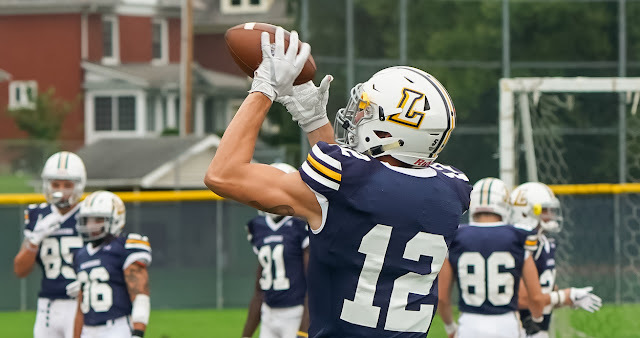 In 2016 Lycoming lost 24-21. Last year, the Lyco defeated FDU 48-21. Sr WR Nick Costello (Havertown, Pa./Haverford) warming up. In that game, Senior Nick Costello (Havertown, Pa./Haverford) caught two first-quarter touchdowns and four other Lycoming College football players scored as Lycoming withstood a fast-moving FDU-Florham offense with a devastatingly efficient one in a 48-21 Middle Atlantic Conference win to send the 2,000-plus fans in attendance for Homecoming & Family Weekend from David Person Field happy. Out of 20 wins against the Devils, the Warriors defense kept FDU under 10 points seven times. Over 25 years of play, Lycoming has scored 837-379 with the highest single game score of 55-12 in 2013. So this should be a very competitive game in Madison this year. We hope you can travel there for the 1:00pm start. We will be there taking photos and putting out a quick photo post on the road home. Keep looking for it. Sunday afternoon, we should have the complete photo album finished by then.